Raju Kage's statement came days after the Karnataka chief minister said that Prime Minister Narendra Modi glows because he "applies wax and make-up". Former BJP MLA Raju Kage made a racist comment saying that PM Modi is fair and HD Kumaraswamy is dark. As the 2019 general election fever is underway, politicians have stooped so low that their campaign narrative is sometimes hitting below the belt. 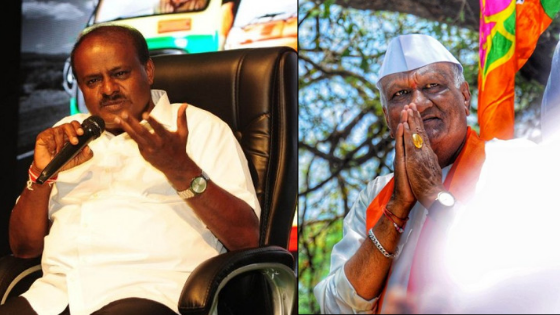 A former Bharatiya Janata Party (BJP) MLA Raju Kage stirred up controversy after making a bizarre comment against Karnataka Chief Minister HD Kumaraswamy saying even if Kumaraswamy washed himself 100 times, he will still look like a buffalo. The former BJP MLA's statement came days after the Karnataka chief minister said that Prime Minister Narendra Modi glows because he "applies wax and make-up". "When PM Modi wakes up before appearing in front of the camera, he applies wax and makeup and then stands in front of the camera. The shine is visible on his face. But in our case, we just shower and leave. The next morning we either shower or just wash our faces. So, our faces don't look good on cameras," Kumaraswamy said while addressing a rally in Bengaluru. Responding to Kumaraswamy's 'cosmetic' statement, Kage said that PM Modi is fair and HD Kumaraswamy is dark. "Kumaraswamy says PM Modi applies make-up 10 times and changes 10 clothes per day. Arre, PM Modi is fair and good looking. Whatever, he does, looks good on him. Kumaraswamy, even if you bathe 100 times, you will be like a buffalo," Raju Kage said. The former BJP MLA was once booked for allegedly assaulting a businessman from Ugarkurdh KH village in Raibag taluk for posting a defamatory comment against him in his Facebook account.